Edirne is a historic town in the western part of Turkey. It is situated near the borders with Greece and Bulgaria. Edirne from the Greek border is at a distance of 7 km and the Bulgarian - about 20km. In the course of history Edirne was called by different names in different cultures - in a historical context, it is known as Adrianople, the Turkish name is Edirne, the Greek - Adrianupoli (Αδριανούπολ). 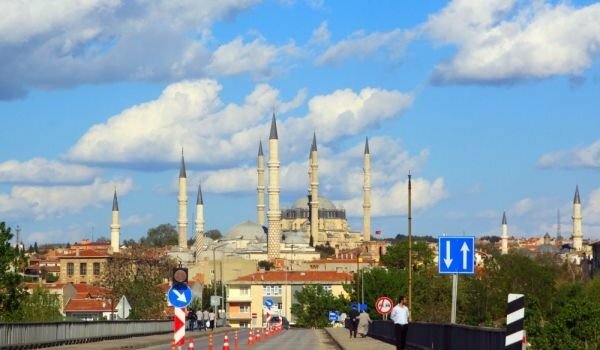 Edirne is the capital of the homonymous Province and has a population of about 130 000 people. Edirne was founded by Roman Emperor Hadrian at the site of an ancient Thracian settlement and was baptized in his name - Adrianople. Later it was conquered by Ottoman Turks - in 1369, and served as their capital until the fall of Constantinople in 1453. In the course of history the area around Edirne was the scene of many important battles - over 15 from antiquity to today. The wars with Bulgaria are a significant part of them. First Kardam Khan defeated a large Byzantine army near Adrianople, Simeon besieged Adrianople and Tsar Samuil conquered and plundered it. Fundamental in Bulgarian history is the battle of 1205 in which King Kaloyan defeated the Crusaders. During the Balkan War, in 1913 Edirne was besieged and captured by Bulgarian troops. Traditionally, living in Edirne today are many Bulgarians – there are Bulgarian schools and churches, of which currently remain St. George, from 1880 and St. Constantine and Elena, built in 1869. One of them is about 500 meters east of the famous Mosque Selimiye. Selimiye Mosque is from Sultan Selim II, which is today one of the most interesting and impressive buildings in Edirne. This temple was built in 1575, it was designed by the most prominent at the time the builder from old Turkey - Mimar Sinan. He built the mosque in Sofia. Selimiye Mosque has minarets, reaching a height of 70 meters, which are distinguished by their beauty and elegance and are considered the highest in all of Turkey. The main dome is greater even than that of Hagia Sophia in Istanbul. The temple has 999 windows, because some believe that this is a magic number. 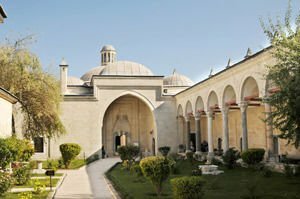 The Mosque of Selim II has ideal proportions and a rotunda without support in the interior. More interesting is to visit the Palace of the Empire or Edirne Palace, it was built in the reign of Murad II. In Edirne pass the rivers Maritsa, Arda and Tunja, there are several old bridges, which today are considered part of the cultural heritage of the city. Edirne has a historical covered bazaar, which was almost destroyed by fire 3 decades ago, but was restored, it is a symbol of the city. Here one can find all sorts of shops and craft workshops. At the northern end of Edirne is another landmark - the prison tower from the Middle Ages, known as Edirne Tower. In parallel, Edirne is known as an excellent university center. Trakya University is one of the best in the country. It functions since the 80s of last century and has a very good medical school, hospital and symphony orchestra. The cooking in Edirne is traditionally Arab. Throughout the central part of town are spread duner shops that passersby become accustomed to, after they try their duners. They are traditionally hot so if you order it with hot, you will have to deal with the "hot chili". It is imperative to try the famous tavajiger, offered in all restaurants in Edirne.